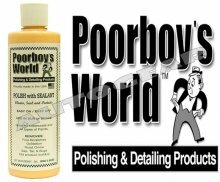 Poorboy's World is proud to announce the arrival of our newest product, Polish w/ Sealant (PwS). This is an AIO (All in One) product that no detailer should be without. We have tested and tested and tested this product to make sure it will be a new staple in everyone's detailing bin. It is a pad dependent product and can be used by hand or any type of machine. By hand it works like a sealant or glaze and by machine can remove swirl marks as well as light scratches and haze, while leaving a sealant behind for protection. I'm sure everyone will be impressed with the glow and slickness that can be had with minimal effort.